Next week, we host our second week of summer camp in partnership with our brilliant neighbors at Creative Action. The theme will be Tastes of Texas. 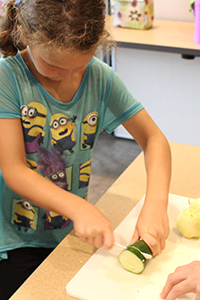 Forty-five campers will get to experience all three of our main programs and make a seed-to-plate connection as they learn about where their food comes from. 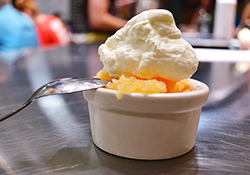 Read on to learn about all the exciting activities we have planned for the campers, plus get a great recipe for Honey Yogurt Cream Sauce! Baylor Scott & White Health: Once again, we are proud to announce our collaboration with Baylor Scott & White Health. They will be tabling this weekend next to our Taste the Place Booth. Come talk to their dietitian and chef as they help make farm fresh and local snacks from the market. 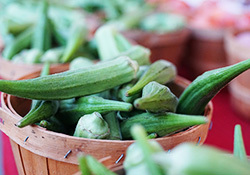 Organic Bhindi Okra: Stop by the Tecolote Farm booth this weekend for your pick of tender, beautiful, hand-picked, fresh organic okra and the tomatoes you need to stew them with! Be sure to also check out their selection of red, gold and purple potatoes, purple and white eggplant (picked at peak ripeness so they're never old or bitter), and cucumbers for salads or pickles. 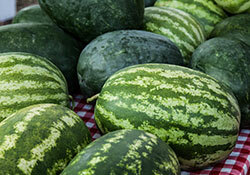 Look for their other surprises like zucchini relish, sorrel melons and fresh summer watermelon too. Organic Chocolate: New from Cocoa Puro - 100% cacao bars, sourced from a single farm in the Dominican Republic, named Finca Elvesia. These bars are made from organic cocoa beans that provide great, intense flavor without added sugar or sweeteners. 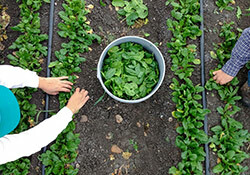 Co-op Veggies: Yard to Market is a unique cooperative featuring local gardeners who share their bounty with you. Visit them this weekend for fresh greens and tomatoes. Natural Skin Care: New from Medicine Woman Herbs - Earth & Herb Natural Skin Care presents "Sun Worshipper" Natural Sunscreen, available in 4oz or convenient 2oz pocket/purse sizes. These products are made with all natural and organic ingredients, so you can be confident that no chemicals are being applied to your skin.